British extreme metal icons CARCASS will release a collection of unreleased and hard to find tracks this November entitled the Surgical Remission/Surplus Steel EP. All the songs were recorded during the Surgical Steel sessions, which was produced by Colin Richardson (NAPALM DEATH, BOLT THROWER, GOREFEST, CANNIBALCORPSE, SINISTER, RODRIGO Y GABRIELA) and mixed/mastered by Andy Sneap (MEGADETH, ACCEPT, EXODUS, TESTAMENT). The EP will be release on physical and digital formats on November 11 (North America), November 14 (Europe) and November 17 (UK). "A Wraith In The Apparatus"
CARCASS will return to the United States once again this October/November! Joining them on select dates are Florida death metal legends OBITUARY and the eclectic champions of “murder metal”, MACABRE. Death grinders EXHUMED and newcomers NOISEM will open each night of churning insanity as well. CARCASS released Surgical Steel last September and came in at #41 on the US Billboard Top 200 Chart, just narrowly avoiding the dreaded “top 40 band” moniker. 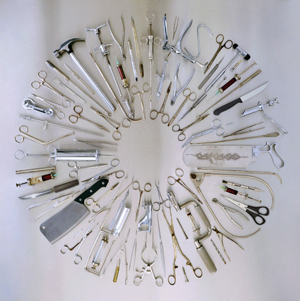 Even with their impressive back catalogue, Surgical Steel has given the band their highest charting and possibly most critically acclaimed record to date.